When TomTom went solo with its own running watch in 2013, I wasn't convinced it would carve out a name for itself in the fitness market. I was wrong. With each watch, the sat nav maker has proven that this isn't just a side project; since it launched the Runner, TomTom has positioned itself as a fitness brand as much as anything else. The latest watch from the company, the Spark, tweaks the existing technology and adds one big new feature: built-in music. The Spark comes with 3GB of onboard storage for loading up your tunes, which should give you just over 500 songs. 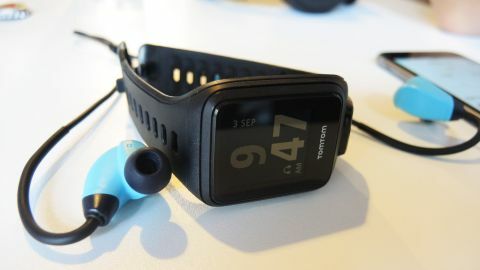 Its a logical next step: most of us listen to music while we work out, and so far all of TomTom's watches have been designed to work without a smartphone. Yes, TomTom is fighting the phone once again, but unlike the dedicated sat nav I think dedicated fitness devices will have the upper hand for the foreseeable future. The best thing I can say about the design of the Spark is that it's smaller. Anyone who's used the Cardio or Multi Sport will probably agree that both watches were a lot bigger than we'd have liked. However until now, TomTom has treated its watches as devices you'd strap to your wrist when going for a workout and then taking off again after; the Spark is designed to be worn all day, and even through the night. More on that later. So while I wouldn't say the Spark is a looker, it shouldn't attract any strange gazes when you're out and about on non-fitness business. And like so many other wearable makers, TomTom has realised that variety is important, so it's offering the Spark in a variety of colour options and in two strap sizes. The larger has the Cardio's two-prong holes, but I preferred the smaller band on my wrist simply because it was thinner and understated. Music is loaded onto the watch through the TomTom software, via iTunes or Windows Media Player. You'll be able to put playlists from either onto the Spark, while 30 minutes of curated music from Ministry of Sound comes pre-loaded onto the device. Sorry Spotify users, but TomTom told me that the licensing algorithms are too tricky for offline playlists right now. The Watch will only work with wireless bluetooth headphones, and any control over your music beyond selecting a track needs to be done on the headset. That said, a TomTom rep told me that future firmware updates will add more of these functions on the watch itself. As I mentioned earlier, TomTom is also positioning the Spark as a fitness tracker you'll keep on your wrist as you go about your day. Should Fitbit and Jawbone be worried? Maybe a little, but these generalist fitness features feel very basic on the Spark right now. Like the Apple Watch, you'll get a readout on your MySports smartphone app each day telling you how active you were, while sleep tracking will just tell you at which points of the night you were active. These are fine but I believe this sort of information is only truly useful when put in context - data is nice, but what do I do with it? If you've used the Cardio, you'll be pleased to know that the heart rate tech has been improved for the Spark - it gave me a reading after a couple of seconds of being on my wrist. Not only does the improved heart rate tech make for faster readings, it's allowed TomTom to reduce the width of the casing - the Cardio needed to be quite wide to successfully capture a pulse. To go back to my point about fighting smartphones, the heart rate monitor, which features on the Cardio version of the Spark, is a big part of that. If you're not bothered about heart rate, there'll be a slightly cheaper version that misses the feature. If you are opting for the full version, the Spark will set you back £189.99 (around $290/AU$413). As with all fitness devices, it's difficult to give any sort of verdict until you've taken it out for a proper workout. However I can say that, music features aside, the Spark makes some much-welcome improvements on TomTom's fitness tech, including a better design. The day-to-day fitness and sleep tracking features are very basic right now, but with a firmware update some of this could be improved.